Want to add Wi-Fi connectivity to a Canon DSLR that doesn't already have the feature? If you own a Canon EOS 5Ds, 5Ds R or 7D Mark II DSLR camera, the W-E1 Wi-Fi Adapter is a relatively inexpensive option that allows for remote control of your DSLR as well as remote viewing and sharing of captured images. How can a remotely controlled camera be useful for your photography? Imagine a remotely controlled camera in the rafters above a basketball goal/behind the backboard, at the finish line of a race, or otherwise positioned in a location deemed unsafe for bystanders. The possibilities are limited only by your imagination and the Wi-Fi adapter's effective range. Before we dig deeper into all the features this budget-friendly accessory provides, let's take a look at what you can expect as you open the W-E1's box. I imagine that Canon opted for spartan packaging to keep manufacturing costs to a minimum. The cardboard box is quite thin (mine was crushed slightly during shipment) with only a plastic sleeve and a bubble wrap envelope protecting its contents. SD cards are quite durable and the W-E1 appears to be the same, but it is still important to, minimally, keep the card clean to protect the camera it is inserted into. A protective plastic case is not provided and may be a worthwhile investment for protecting the card when not being used in the camera. Otherwise, the card can easily be stored in any memory card case/wallet supporting the SD (Secure Digital) format. Not included in the W-E1's Wi-Fi feature set are camera-to-camera image transfer, direct transfer to a Wi-Fi printer, NFC and most video control features (only browsing and transfer of MP4 video files is supported). The first step in achieving Wi-Fi connectivity involves updating your EOS 5Ds/5Ds R and/or 7D Mark II's firmware (if necessary). If you have firmware version 1.1.0 or later, then your camera already supports the WE-1. Installing the Wi-Fi Adapter is as easy as installing an SD memory card. Open the memory card door on your EOS 5Ds/5Ds R or 7D Mark II, insert the WE-1 into the SD memory card slot, push in until it clicks, close the door and turn on the camera. Your camera is now Wi-Fi capable. Next you need a mobile device or computer to communicate with the W-E1, both of which require special software to be installed. Note that the platform and/or software you choose to use may have an impact on which features will be available while using the W-E1. The W-E1 was specifically designed for use with Canon's Camera Connect app for mobile devices (iOS / Android) and EOS Utility for desktop computers. However, those aren't the only software platforms that can utilize the Wi-Fi adapter (more on that later). 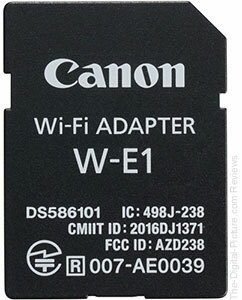 While most photographers will likely use the W-E1 with their smartphones and tablets, I think it's important to illustrate the Wi-Fi adapter's full capabilities by discussing its use with Canon's EOS Utility first. So, let's get connected. First, ensure that you have the latest compatible version of EOS Utility installed on the computer and that the W-E1 is installed in the camera's SD memory card slot. Turn on the camera. If you have your camera set to record to multiple cards (my preference), you will be greeted with a warning message that says, "Card 2 does not support recording | Cannot record to multiple cards." Navigate to the third tab in the Camera Configuration Menu (the wrench) and select Wi-fi function. Upon first use, you are presented with the option to register a nickname for your camera. Press the SET button (choose OK) to accept the default name or your specified name. Use the main control dial to select the computer icon [Remote Control (EOS Utility)] and press SET. On the next screen press the SET button to choose "Easy connection" and press the SET button again to choose OK. The camera is ready to connect to EOS utility. Note the encryption key listed on this window. You'll use it to connect to the camera's Wi-Fi. Using your computer, connect to the camera's Wi-Fi. The encryption key is the network's password. 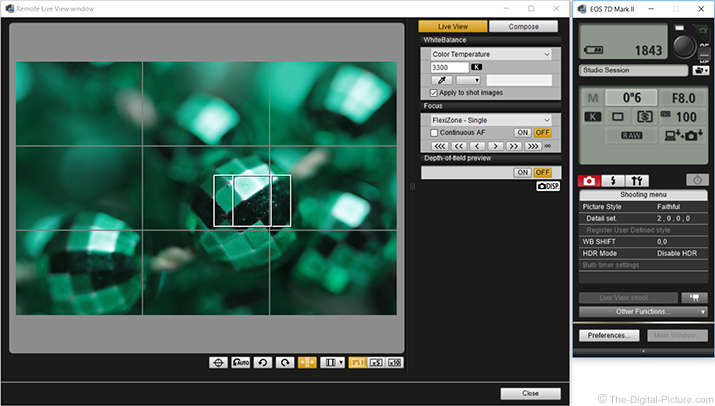 Press the SET button on the DSLR to begin the pairing process. Open EOS Utility on the computer. Click "Pairing over Wi-Fi/LAN." A pop-up window will be displayed and your camera should appear in the list. Select the camera and click "Connect." Press the SET button on the DSLR to accept the connection to the PC. You are now ready to remotely control the camera, transfer images or adjust camera settings from your computer. Note that with the WE-1 Wi-Fi adapter installed, EOS Utility connection via USB is not available. Also know that setting up a network connection is recommended for home/studio setups as your host computer can remain connected to the internet while also connected to the camera and future connections can be expedited after the initial connection is estabilished. While I am sure Canon had a good reason for each and every step in the direct connection setup, I must admit to being a little annoyed at how many of those steps involve going back-and-forth from the computer to the camera. A simpler setup with fewer confirmation steps would have been ideal from an end user's perspective. Thankfully, not all of the steps are required for future connections to the same computer. When connected to a computer, nearly all the benefits of EOS Utility are available for your shooting pleasure. Unfortunately, movie recording is not available while using the W-E1. A word of warning: if you create a direct connection to your camera as outlined above, you will receive an error message when opening the Lens Registration Tool found on the Camera Settings menu. This is because the tool communicates with Canon's servers in an attempt to download any new profiles that are available. You can still use the Lens Registration Tool in spite of the error message (simply press "OK" on the error window) to load lens profiles that are already stored on your computer. If using a network connection with internet access (as in connecting to a router/cable modem), no error message will be displayed. Oddly enough, the EOS Utility Main Window does not reappear after you finish with the Lens Registration Tool window. The computer remains connected to the camera, but EOS Utility will need to be restarted for further use. As preveiously mentioned, one way to reduce the amount of steps involved with future connections and retain internet access (if available) on the remote computer is to set up a network connection in the W-E1 settings. By entering the network information, the connection process is expedited with subsequent connections and EOS Utility opens automatically when it detects the camera has connected to the network. Specify text for "Transfer with Caption"
If there is no need to review each image after proper focus is fixed and exposure settings determined, simply set EOS Utility to save images only to the camera's memory card. 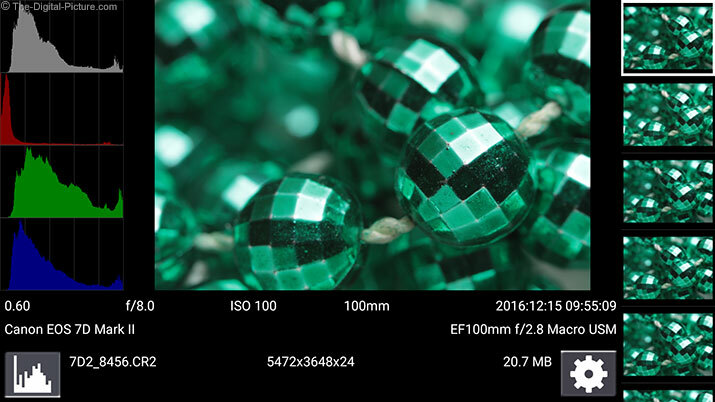 This can be useful if using the W-E1 and EOS Utility for capturing incrementally, manually focused images for use in focus stacking. Note that the camera can only be operated remotely while the W-E1 is being utilized for camera control (most of the camera's buttons/switches as well as the LCD become disabled during use). Overall, the sheer array of options available to you when using the W-E1 with EOS Utility is impressive. Unfortunately, my experience with Canon's Camera Connect app has left me less thrilled with the options availble to mobile users. But before I elaborate more, let's look the typical steps involved in geting the W-E1 connected with a mobile device using Canon's Camera Connect app. Use the main control dial to select the smartphone icon [Connect to smartphone] and press SET. On the next screen press the SET button to choose "Easy connection" and press the SET button again to choose OK. The camera is ready to connect to your mobile device. Note the encryption key listed on this window. You'll use it to connect to the camera's Wi-Fi. Connect to the camera's Wi-Fi using your mobile device. The encryption key is the network's password. After the mobile device has connected to the camera's Wi-Fi, the camera awaits a connection from a compatible mobile application. Open the Canon Camera Connect app. Choose your camera from the "New Camera Found" pop-up window. Press the SET button on the DSLR to accept the mobile device's connection. As with a network connection to a computer, subsequent connections to your mobile device require fewer steps permitting faster connection. Following are the camera settings and features available using the Canon WE-1 and Camera Connect app. Conspicuous is that several features available while using EOS Utility with the W-E1 are not found in the Canon Camera Control app. The most glaring omission may be the inability to adjust the camera's white balance. While I find this feature exclusion to be a real head-scratcher, I'm hopeful that Canon will add the ability to change white balance (and maybe even more functionality) in future app updates. Here's a look at the Camera Connect app on a smartphone connected to a W-E1-enabled EOS 7D Mark II. The Canon Camera Connect app can be used in horizontal or vertical orientation. Regarding the user interface, notice how much wasted real estate there is on the Camera Connect remote Live View screen. The downside to the under-utilized space is that you must scroll through various camera settings in order to change them. Besides the ability to adjust white balance, another feature I would like to see in the Camera Connect app is the ability to browse and transfer images to my mobile device directly from the quick preview screen while remote Live View is active. As the interface is currently designed, you can only preview images that were captured since the remote Live View session was initiated. While you can zoom into images to ensure proper focus was achieved, no other image options are available in the preview window. Instead, you must exit remote Live View and choose "Images on Camera" from the home screen to open a gallery view of the images before options like transferring to mobile, rate and delete become available. And while on the topic of the gallery, note that the gallery does not change orientation when you rotate the camera horizontally. Portrait orientation is your only option. 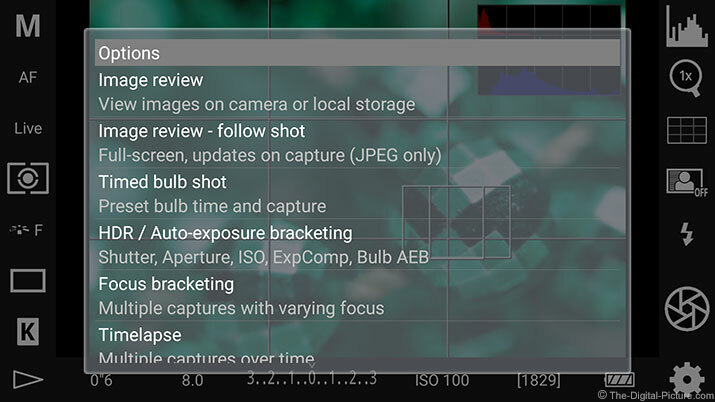 I find it odd that I can see all of the important camera settings using the Info icon (top-right), yet I cannot change the file type recorded or adjust metering options or the Live View metering result. Unlike with EOS Utility, you can only download 1920 x 1280px sized JPEGS to your mobile device when the camera is set to RAW capture. This may seem like a significant downside of using the app, however, keep in mind that the app is mainly targeted to users who want to quickly and easily post images to social media. And for social media purposes, the resolution works well (assuming no significant cropping is necessary). One major benefit of the limited resolution is that transfers happen almost instantaneously – significantly shorter than the time required to transfer full-resolution JPEGs with EOS Utility. However, if your camera is set to capture JPEGs, then the Camera Connect app gives you the option to download images at the 1920 x 1280px resolution (default) or the originally recorded resolution. The option not to resize transferred images can be found in the gallery settings menu. Overall, I found the Camera Connect app to work well within the confines of its own seemingly arbitrary set of limitations. It's easy to connect, reliable, and has worked for me without a hitch. I expect it will work very well for 80% of the customers who purchase the W-E1. For power users, though, there are more intriguing options available. By "intriguing options," I'm referring to third-party mobile applications designed for remotely controlling your DSLR camera. Specifically, both DSLR Controller for Android and Cascable for iOS are compatible with the W-E1. The steps required for connecting to the WE-1 with a third-party remote control application are the same as the steps used for connecting with the Canon Camera Connect app. Once the Wi-Fi connection has been established and the remote app opened, a wide array of settings and/or features unavailable in Canon's dedicated remote app become available. 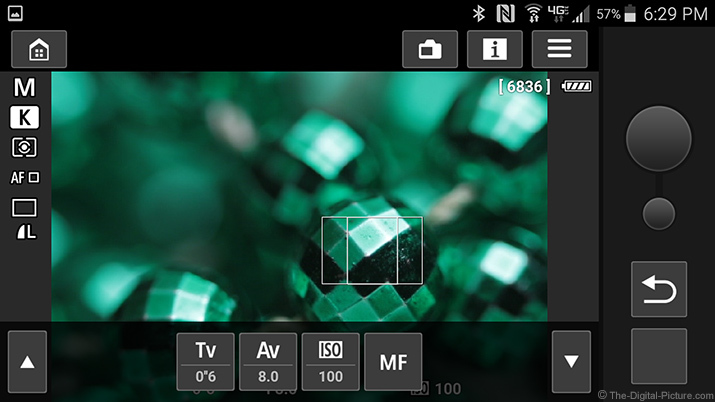 Following are a few screenshots showing DSLR Controller for Android in action. 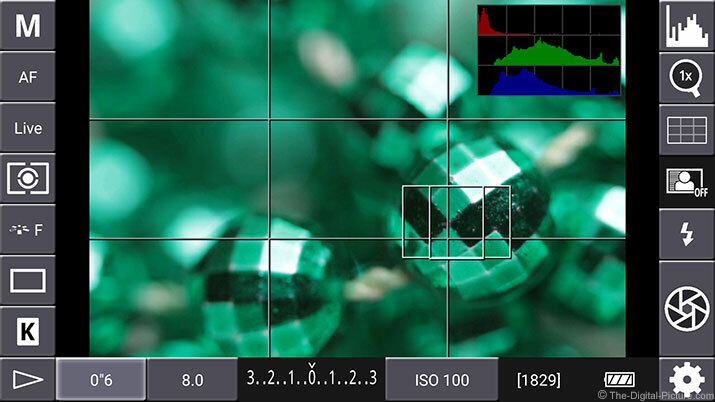 One of the most intriguing features of the DSLR Controller app (for me, at least) is the ability to set the camera to capture a specified number of incrementally focused images for use in focus stacking, a technique often used in – but not limited to – macro photography. With focus stacking, you can create an image with significantly more DOF (Depth of Field) than can be obtained in a single exposure. The technique also allows for the use of apertures narrower than your camera's DLA (Diffraction Limited Aperture) so that maximum image sharpness can be acheived. 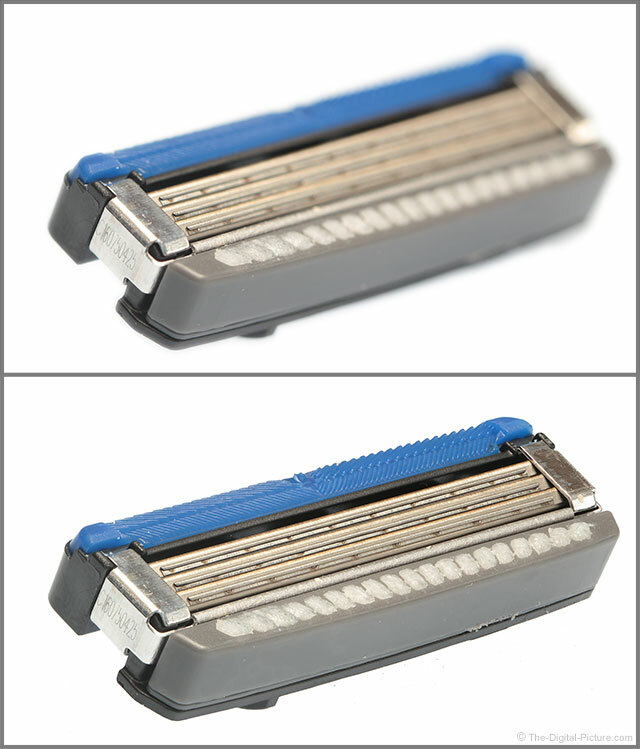 Below is an example demonstrating the benefits of focus stacking. The first image shows the DOF which was obtained in a single capture using an f/5.6 aperture. The second image was created using special software to compile the sharpest in-focus segments of 36 images (all utilizing the same f/5.6 aperture) with each capture set to an increasingly farther away focus point. Likely important to some is that DSLR Controller does not allow for vertical orientation use like the Canon Camera Connect app. Another feature available in the Camera Connect app, image rating, is also unavailable in DSLR Controller. Being a third-party app, you may experience the occasional bug using DSLR Controller. For instance, more than once I've returned to the remote shooting screen from the gallery view with all the exposure settings disabled. Reopening the gallery and exiting again has corrected the issue. The biggest issue I've experienced while using DSLR Controller is that the application breaks its connection with the W-E1 when the app loses focus (when the operating system switches to another application). Regardless of the minor issues encountered, DSLR Controller is my default remote application when using the W-E1. For iOS users, though, there's Cascable. Not having an iOS device for testing, I asked Cascable's developer Tim Kitchener to send me a list of features available in the app that were not available to users of Canon's Camera Connect app. Below are the features he mentioned. As is likely evident, third-party apps provide a bevy of features and benefits over Canon's Camera Connect app. However, as apps tend to get better over time with future development, the chasm in functionality between Canon's own app and third-party apps may diminish. And even though I have no first-hand experience with Cascable, I expect that fewer bugs will be experienced using Canon's own remote application compared to third-party offerings. The Canon W-E1 Wi-Fi Adapter used for this review was purchased online/retail. Overall, the W-E1 is a great product. For a low cost, the practically no-footprint device adds basic Wi-Fi features with the Canon Camera Connect app (and even more functionality with third-party remote control apps) to the Canon EOS 5Ds, 5Ds R and 7D Mark II. The only significant W-E1 downside is the loss of use of the SD card slot for image/video storage purposes. 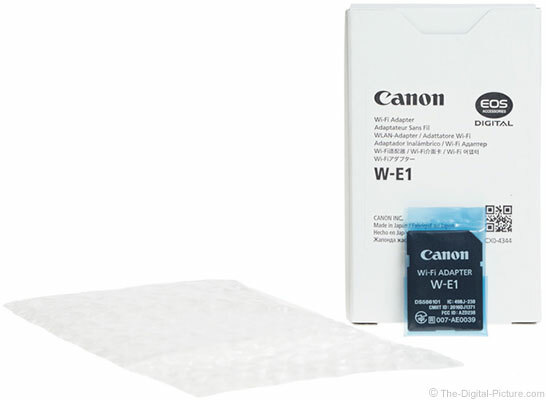 A great number of photographers are going to find Canon W-E1 Wi-Fi Adapter worth having in their kits and some are going to find it indispensable.